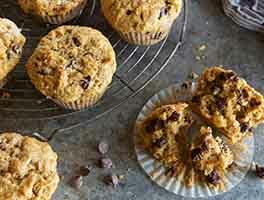 Muffins without eggs, milk, or butter — what's the secret? Tomato juice, which adds the necessary acidity for leavening; nice, moist texture, and gorgeous burnt-orange color to these cranberry-nut muffins. And don't worry; they don't taste like tomatoes! 26 mins. to 32 mins. Preheat the oven to 400°F. Lightly grease and flour the wells of a muffin pan, or line the pan with paper liners, and grease the liners. Whisk together all the dry ingredients, including the cranberries and nuts. In a separate bowl, whisk together the vanilla, vegetable oil, and tomato juice. Stir the wet ingredients into the dry ingredients; don't over-mix, stir just until everything is moistened. Spoon the batter into the prepared muffin cups, filling each nearly full. A level (to slightly heaped) muffin scoop of batter for each muffin works well here. Sprinkle the tops with coarse white sparkling sugar, if desired. Bake the muffins for 18 to 20 minutes, until they've domed nicely and they're lightly browned around the edges. 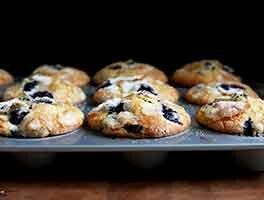 Remove the muffins from the oven, and transfer them to a rack to cool. These muffins keep extremely well. Wrap individually; or set on a plate, and wrap loosely with plastic. They'll stay fresh and moist for up to a week. This is the 2nd time that I've made these muffins. The first time I made the recipe exactly except for using blueberries in it. This time I used orange juice as another reviewer mentioned and it was SO MUCH better than the tomato juice. I thought the tomato juice was fine but it would not be a recipe I made other than for vegan friends. Changing to orange juice, I would make these for non-vegans in a heartbeat! Since I was using orange juice anyway, I zested and orange and used that as well. I used 1.5 cups frozen blueberries and raspberries as my fruit and did not add nuts. They were fantastic! Definitely 5 stars. Due to adding the fruit, it ended up making 16 muffins. These don't rise much. I think I will add a tablespoon of chia seeds to the next batch to act as egg replacement and help them rise a little more plus them adding to the health benefits. Yum! Just delicious. Fantastic recipe! I've been making it for many years now. I cut the sugar and oil amounts in half and they still taste great. I was skeptical at first, but you really can't taste the tomato juice. 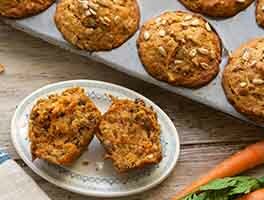 Finally an amazing vegan muffin!! Moist, good texture unlike past recipes I've tried that turned out as inedible hockey pucks or gooey, doughy fails. Great inspiration --I subbed homemade cranberry sauce for dry fruit and omitted the sugar (plenty went into the cranberry sauce!! ), added oats, subbed lemon extract & lemon peel instead of vanilla, used about 1 Tbs of cinnamon and 1/4 tsp ground cloves. Made it suit my taste and ingredients on hand. Love these as part of a quick & yummy breakfast. I substituted fresh with dried cranberries and had to sub a small amount of the V8 with water because i didnt quite have enough. Since i live in the mointains I replaced part of the oil with egg and baked at 415°. These turned out GREAT! I just ate two and anticipate none of them will go to waste. There's no tomato flavor, as promised, which I appreciate since I'm not a fan of tomato juice. We used OJ. I didn't have enough brown sugar, so used just a little white with brown, but still under amount called for. I like using extra cinnamon too. I really love this recipe but I live in Denver and they don't rise. Maybe I should say they rise and fall. Does anyone have any recipe adjustment recommendations? I have made these muffins several time since first discovering the recipe five years ago. 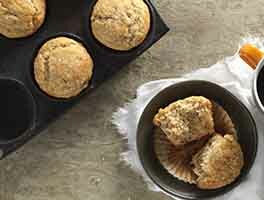 I have a standard size muffin pan and recipe yields are usually spot on, but this recipe has always made 16 muffins for me. There's no way the batter would fit in 12. I have an extra muffin pan, so it isn't a big deal. Nice recipe for when I want muffins, but am out of eggs or forgot to soften butter in advance. I've made this recipe tons of times. It's amazing! 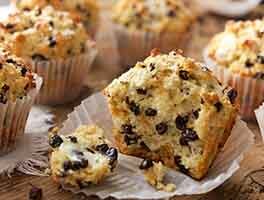 The muffins are tender and flavorful. I always get rave reviews and people can't believe they're vegan. Thank you KAF for another awesome recipe. Made these for a class treat- there were a couple of students who were vegan and one allergic to soy, so this recipe looked like the right fit. I made some adjustments: used just 3/4 cups brown sugar & sweetened dried cranberries, also subbed in 1/2 c white flour and 1/4 c whole oats for 3/4 c of the whole wheat flour. Used a bit more cinnamon because I love cinnamon (Vietnamese from penzey's; probably added another 1/4 tsp). Sprinkled cinnamon sugar on top. Puffed up beautifully (I was surprised - really fluffy!). 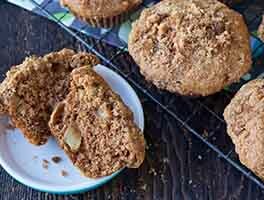 I don't like really sweet muffins, but if I were to make them again I would probably use the full amount of brown sugar - they were tasty with less sugar but I don't think the original amount of sugar would have been too sweet, now that I've had them with less.